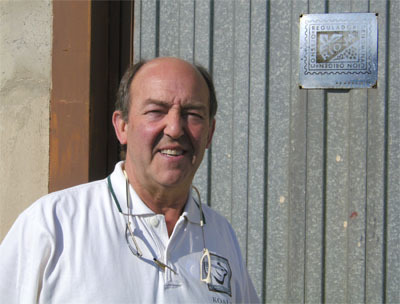 Basilio Izquerdo outside his winery in Laguardia, Rioja Alavesa. The “B de Basilio” 2012 White will be arriving in the US market this fall. As is typical with “B de Basilio” Red, and as Mr. Gutiérrez notes, “It feels very young and it should be long lived.” Because of its youth and power we normally hold back the release of “B de Basilio” Red to give it more time to open. The 2008 “B de Basilio” Red is the current release in the US market. Current releases vary by market.